Learn more about bed bugs and bed bugs services in Ann Arbor. Bed bugs have been human parasites for thousands of years. During the 1940s, they were mostly eradicated in the developed world, but have increased in prevalence significantly since the 1990s due to pesticide resistance, governmental bans on pesticides, and an increase in international travel. They are now so common in that 1 out of 5 Americans has had bed bugs in their home or know someone who has! They have made such a come back in Michigan that several cities top the national lists of most heavily infested. Bed bugs are a small, reddish brown parasitic insects that feed exclusively on blood. You can imagine them as flightless mosquitoes that live on furniture. While newly hatched bed bugs are nearly microscopic, adult bed bugs are readily visible, roughly the size of an apple seed. The name bed bug derives from their preferred habitat, usually living in houses, apartments and hotels near or on beds. They will often live in other areas where people spend prolonged periods of time such as couches and chairs. Bed bugs are mainly active at night, but are not exclusively nocturnal. They usually bite their hosts without being noticed. Bed bugs are not known to transmit diseases, although their bites cause most people extreme itching. Bites are found on the parts of the body that are exposed to during sleep such as your hands, arms, shoulders, neck and face. Bed bug bites are often grouped together in a small area, sometimes several in a row or zigzag pattern. Bites typically look like flat or raised inflamed spots, itchy, red or blistered. Reactions don’t always appear immediately after you’re bitten, they make take a few days to appear making it difficult to determine when and where the bites occurred. Bed bug bites look similar to mosquito bites, flea bites and several skin conditions making it impossible to determine the true cause of the reaction based on appearance alone. A thorough inspection is required to determine if bed bugs are present in your home. In single family detached homes in Michigan bed bugs may be introduced when used furniture that has already been infested is brought into your home. Another possibility is though travel, bedbugs can be brought into your home on luggage by yourself or by visiting friends and family. When staying in an infested room bed bugs crawl into your luggage where they will be moved from one location to another. While it is uncommon, it is possible for bed bugs to be brought into your home by a visitor on an infested handbag, backpack or similar item. In multiunit attached housing situations such has apartments and duplexes there are some additional ways in which bed bugs may access your home. While the possibilities mentioned above are still the most common, bed bugs may also travel from an infested apartment into an adjoining apartment through wall voids and hallways. It is also possible for bed bugs to be spread throughout a building when infested furniture its moved through hallways and bed bugs are knocked off. Don’t panic! Bed bugs in Ann Arbor are rare, it may be a different issue. Save a pest sample or send in a picture for identification. We suggest you go about life as usual and call as soon as possible. Do not sleep in a new area. When you stop sleeping where bed bugs are present they will also leave and start looking for a new host making them more difficult to treat. Do not move furniture. When infested mattresses and furniture are moved bed bugs can be knocked off in the process. This can spread the problem to new areas. After being knocked off it can take weeks for the individual bugs to find a host again leaving them to roam in untreated areas. Bed bugs have the ability to live for a year or more without a blood meal,when they are spread over a large area they can potentially lay dormant in unexpected places and reinfest a home several months after treatment. We can save your furniture! Buying new furniture is expensive and unnecessary. In all but the most severe cases it makes sense to encase your mattress and box spring and treat your furniture rather than throwing it out. You should NOT attempt to treat bed bugs yourself. When bed bugs are treated with certain products it can cause their behavior to change making them less predictable and more difficult to eliminate. We have very specific treatment protocols that are most effective when the bed bugs normal behavior hasn’t been interrupted. If you see live bugs we suggest you squish them, vacuum them and discard the bag or spray them directly with a small amount of isopropyl alcohol. (Use caution, isopropyl alcohol is flammable.) These simple techniques will not interfere with our treatment. 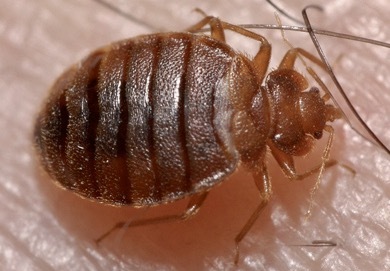 If you think you have bed bugs, read more about our service or contact us. Previous Post: Do I have fleas? Next Post: What kind of wasp is this?